m a y f i l e s . . .: Kitchen Snuggles. Is that Possible? Yes! One possibly more unusual item, I felt was essential in my kitchen was a cuddle spot for reading. As the hub of family life I wanted a place directly in the action, out of the action. This has to be our family's favorite single or double snuggle spot in the house. We have a super soft blanket just wrapped around some foam, until I get around to sewing cushions. In the mean time it is a luxurious snuggle. 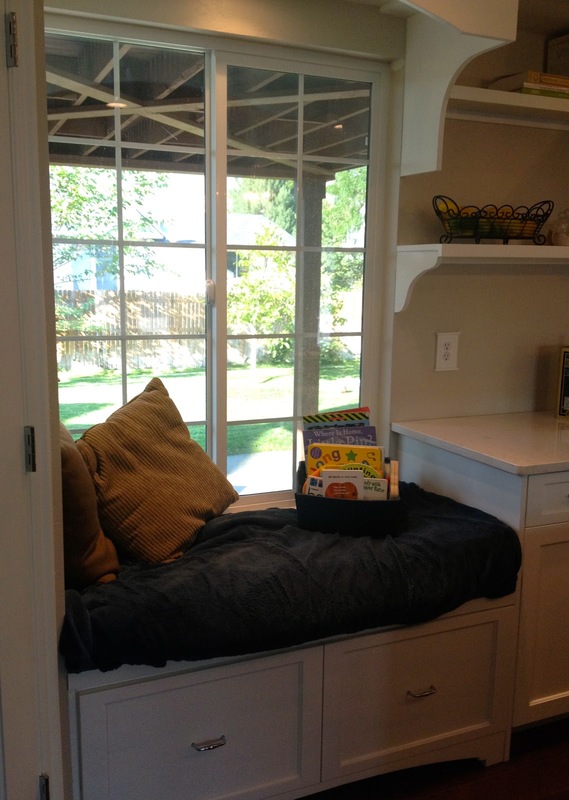 The seat is 25" deep and 54" long, so there is plenty of room to curl up with a book, or the morning newspaper. I added a soffit, corbels, and arch to enhance the feeling of enclosure. With your feet off the ground you become entirely out of the "work way." It is a perfect place to be right in the action, but out of the action. The large window lets in lots of natural light all day, but indirectly, so it never becomes uncomfortable or glaring. A peek at Mt. Timpanogos and the back yard are just added perks. Finally below the seat are 2 gigantic drawers. One is filled with books and quiet games, the other with pillows and blankets. Another fun aspect of the window seat, is it allows Emmett and Berkeley to be in on the action without pushing and banging around stools and chairs. Our toast supplies are in the adjacent cupboard. The two little munchkins love to stand on the window seat and help Ellery and Callista make toast.